Participants of the six-day Mental Health Management Program Workshop realized that the well-known adage “nothing succeeds like success” rings very true. Organised by the National Health Mission (NHM) and technically supported by Programme for Improving Mental Health Care (PRIME), the workshop took place at the district level in Madhya Pradesh. From 5-8 December, two nurses and one medical officer each from a range of districts (Guna, Damoh, Chhinwara, Barwani, Ratlam, Dewas, Burhanpur, Narsinghpur, Bhind and Sehore) attended the workshop. During the 2nd phase (17-22 December), another 2 nurses and 1 district medical officer from each of the districts of Damoh, Datia, Dhar, Guna, Mandsaur, Satna, Sehore, Sheopur, Shivpuri, and Umaria attended the same workshop. During both workshops the nurses learned more about the Healthy Activity Program (HAP) and honed their counseling skills.The medical officers joined the groups for training on mental health management information systems (MH-MIS), procurement and supply management (PSM) and case management. The workshops were presented by Dr. Sanjay Shrivastava, the clinical director at PRIME-India; Ms. Shalini Ahuja, a research fellow at EMERALD (Emerging Mental Health Systems in Low- and Middle-Income Countries); Ms. Medha Upadhyay Bhate, a Sangath supervisor; Ms. Bindiya Chodankar, a Sangath supervisor; Ms. Kimberly Lacroix, a research officer at Sangath, and Mr. Azaz Khan, the project officer from the Public Health Foundation of India (PHFI). 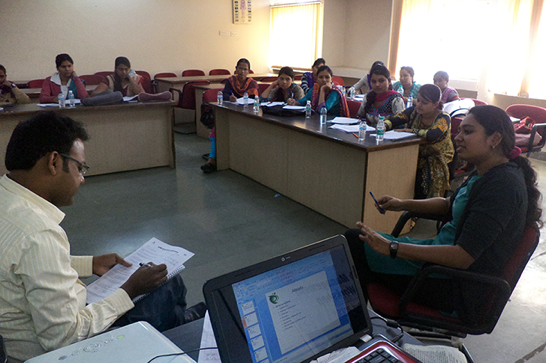 The training in itself was an invigorating experience for the participants. Roleplaying was an integral part of the workshop and they were trained in the usage of the Patient Health Questionnaire (PHQ-9) and the SMILE cards. The Star Software towards enhanced Health Management Information System (HMIS) was introduced to the team by Ms. Shalini Ahuja. The team was in doubt regarding the implementation of the system. With the facilitation of Dr. Sanjay Shrivastava resolutions were taken, and recommendations to overcome the queried obstacles were given in the last lap of training. It was important for the PRIME-India team in Madhya Pradesh to establish and sustain an inter-agency core group that will ensure apt counseling, proper recording of medicine stock and utilisation, maintenance of the management information system, and formation and proper utility of the WhatsApp group. The participants agreed on the above recommendations for their future work. Ms. Faiz Ahmad Kidwai, the mission director at the National Health Mission in Madhya Pradesh and the PRIME-India team graciously offered to coordinate the inter-agency core group on facilitation of the programme.